It’s already been a number of weeks since a ball was last kicked in the Bundesliga, and the lack of top-flight German action is driving us mad! But fear not, the 2017/18 season is just around the corner and the fixtures for the upcoming season have been announced! Click right here to see all of the Bundesliga fixtures for 2017/18! As with every season, fans and players’ eyes will rapidly scan through their team’s list seeking out those key fixtures: Who’s our first opponent? Will we have the chance to lift the Meisterschale in front of our own fans on the last day? When are our rivals in town? Well, we can help. Now bundesliga.com has taken a look at some of the biggest match-ups you can expect this season. These two Bundesliga giants are once again favourites for the title this season, and they have become very familiar with one another in recent years. Since April 2012, Bayern and Dortmund have met an incredible 22 times in all competitions, including three DFB Cup finals, four Supercups and the 2013 Champions League final. Both sides will have mixed memories from their results in 2016/17. The Bavarians were victorious in August’s Supercup (2-0) before the Black-Yellows turned the tables in the first Bundesliga meeting to inflict Bayern’s first defeat of the season. The champions were far too strong for the visitors in the reverse fixture in Munich, comfortably winning 4-1, but BVB had the final laugh of the season with a 3-2 win at the Allianz Arena in the semi-final of the DFB Cup to knock the defending champions out. They call it the ‘mother of all derbies.’ Dortmund vs. Gelsenkirchen, Black and Yellow vs. Royal Blue: The Revierderby is much more than just a football match and makes losing not an option. Both meetings last season were tight affairs with neither side getting their noses in front after two draws (0-0 and 1-1). The two Ruhr clubs have new head coaches in the dugouts for the upcoming season following the arrivals of Domenico Tedesco to Gelsenkirchen and Peter Bosz to Dortmund. 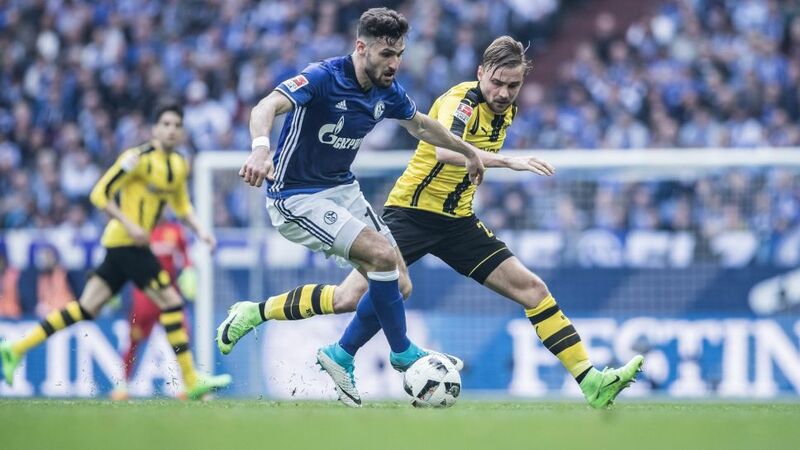 Both bosses will therefore be making their Revierderby bows when the old enemies meet for the first time in 2017/18, and no doubt both will have this fixture clearly marked on the calendars in their offices. Dortmund will be looking to notch up a 33rd victory over their local rivals, whilst Schalke will aim to close the gap with a 31st win. One of the Bundesliga’s nascent rivalries, Leipzig were the closest competitors for eventual champions Bayern in their debut top-flight season. The clubs met competitively for the first time in December 2016 with the Bundesliga record champions and newcomers level on points after 15 games - a game Bayern won comfortably 3-0. However, it was the second meeting on the penultimate matchday that will live long in the memory as the two sides put on a show in the game that saw the most goals in 2016/17. Leipzig were impressive as they led the champions elect 3-1 and 4-2 before going on to lose for the first time in the Bundesliga from a winning position as the Munich side turned on the afterburners with three goals in the closing minutes to claim their first-ever 5-4 victory in the Bundesliga. Will Ralph Hasenhüttl’s runners-up push the champions again this season and maybe even go one better come next May? This fixture has been entertaining the masses for all but one of the previous 54 Bundesliga campaigns. The first edition of the Nordderby this season will be the 107th since the Bundesliga was formed in 1963, extending its record as the most played match in the German top flight. The fixture has also seen the most draws in Bundesliga history, with the 34th coming in the first half of last season (2-2 in Hamburg). For the first time since 2003, the Bundesliga season will open with the infamous Rheinderby between the Foals and the Billy Goats. On that day 14 years ago, it was Gladbach who prevailed 1-0 after an own-goal from Cologne's Matthias Scherz. Click right here for more Bundesliga news and features!